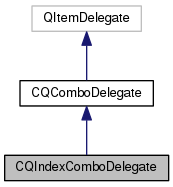 Definition at line 64 of file CQComboDelegate.h. Definition at line 139 of file CQComboDelegate.cpp. Definition at line 143 of file CQComboDelegate.cpp. Definition at line 146 of file CQComboDelegate.cpp.